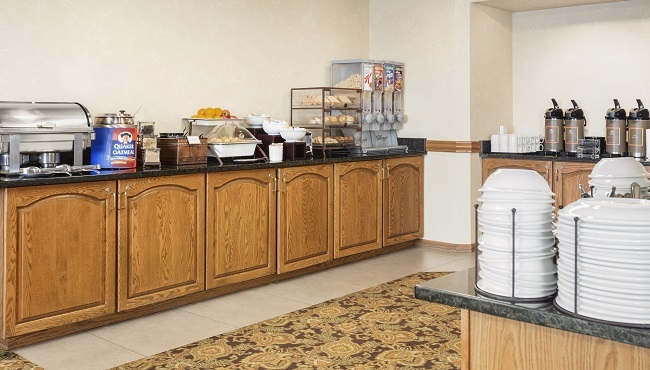 At the Country Inn & Suites, Lincoln North Hotel and Conference Center, we tantalize your taste buds each morning with our free, hot breakfast. You can savor hot and cold favorites like Belgian waffles, yogurt parfaits, oatmeal and fruit salad, all served in our modern dining area. We also offer rotating hot items like bacon, French toast and make-your-own burritos to add variety to your morning meal. When you're ready for lunch or dinner, ask our friendly front desk staff for nearby dining recommendations. Breakfast is served using classic diningware, glasses, mugs and utensils for that home-cooked-meal feeling.